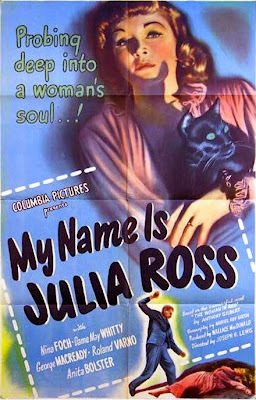 My Name Is Julia Ross, a neat suspense movie, has been a favorite among the film festival circuit and revival movie houses for years now. 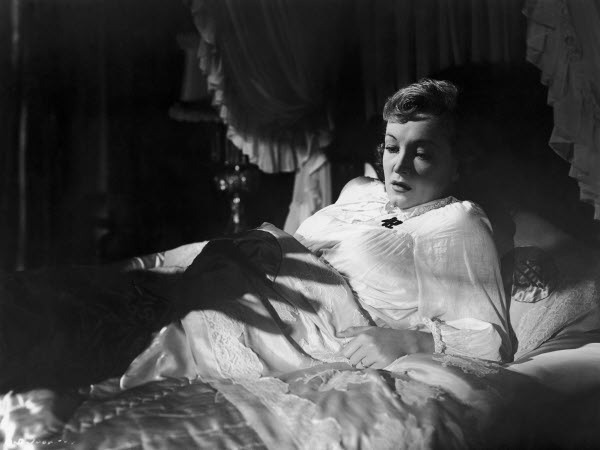 Early last year it was finally released on DVD as part of Columbia Picture Film Noir Classics, Volume 3. After months of trying to find a store in Chicago that had it for rental I stumbled across it through sheer luck when I found an online version. But like many movies which I have been waiting to see for years (I recall a similar experience when I finally got to watch The High and the Mighty) I was a little disappointed. For me it was an entertaining film with a few surprises, but due to its predictable and very familiar plot a movie that didn't thrill me as much as I had hoped for. Still, there's much to recommend the film. 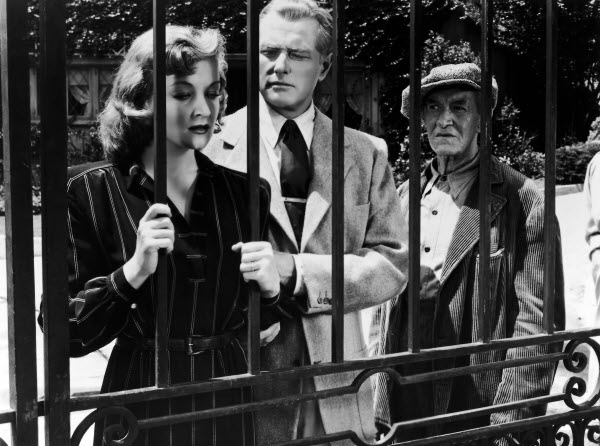 Based on The Woman in Red by Anthony Gilbert, an out of print vintage mystery I have not read, it tells the story of Julia Ross, a down on her luck and unemployed secretary played with conviction and glamour by Nina Foch. 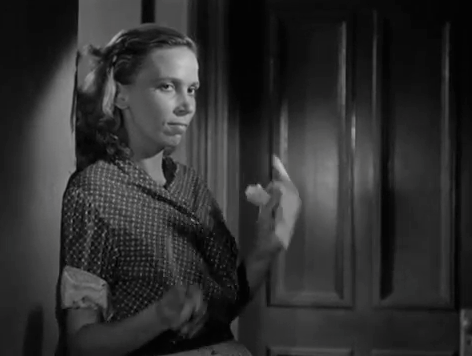 In the opening scene Julia deals with Bertha, a bitter charwoman (Joy Harrington in nifty but unbilled minor role) who taunts her for being behind on the rent and out of work. "Secretary? Sittin' an' writin' all day. Call that work?" she sneeringly throws in Julia's face when the desperate young woman sees an ad that seems perfect for her. Julia rushes out of the boarding house to the Allison Employment Agency to apply. At the employment office she learns of the odd requirements: no family ties, no boyfriends, and the job will require her to move in and live with her employer. Julia has no choice. She needs the job badly and wants to pay up on her back rent. 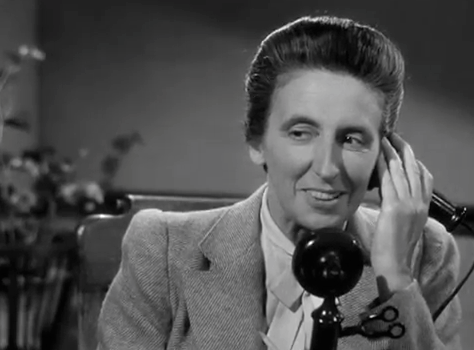 A simple phone call to Mrs. Hughes by the hatchet faced Miss Allison (Anita Bolster) seals the deal. Julia must wait to meet Mrs. Hughes who just happens to be in the neighborhood for the interview and final approval. 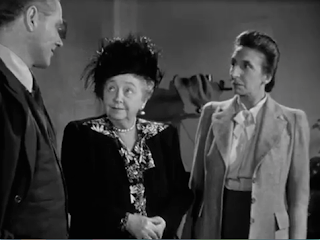 She shows up and it's Miss Froy from The Lady Vanishes. 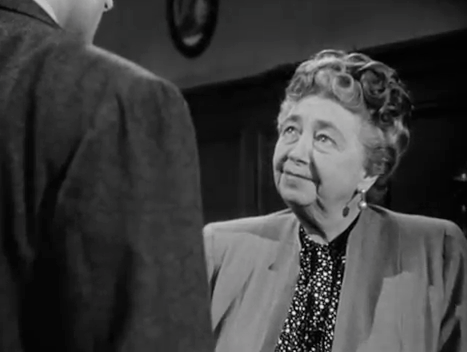 Whether she's playing a spy or an English matriarch Dame May Whitty is always a joy to watch. 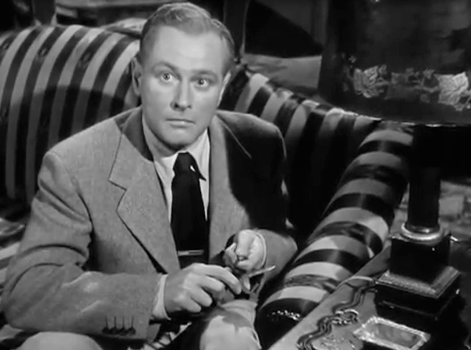 Julia also meets her gloomy but sharply dressed son Ralph (George MacReady with his signature thrilling and gravelly voice). They hire Julia immediately. All shake hands, Julia receives an advance, Mrs. Hughes urges her to go shop for new clothes and they'll meet her at the house later in the evening. With Julia gone we now learn that the trio are up to no good. 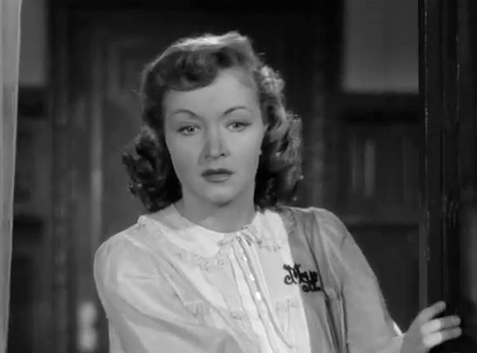 Mrs. Hughes drops her charming facade and cries out a bit sinisterly, "She's perfect!" Ralph adds cryptically, "There's even a small resemblance." 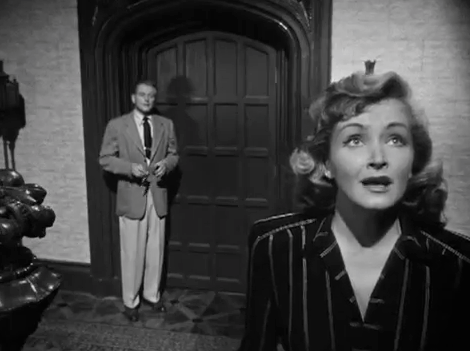 Mrs. Hughes calls for Peters, a man who spied upon them from a closet. "Did she see you?" "No, madam," he says. "I made sure of that," confirms Miss Allison who we now know is really Sparks. "See that you keep it that way, especially at the house," Mrs. Hughes orders in a stern voice. They close up the agency and head on home. What have they in store for Julia? This doesn't seem like it's going to be your average everyday sittin' an' writin' job. 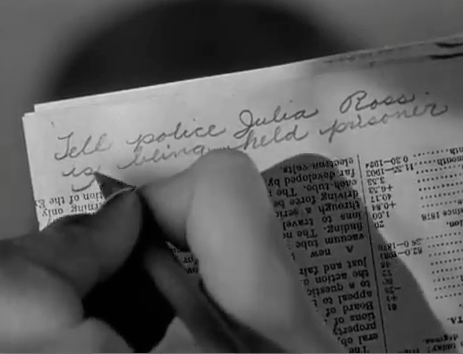 Julia is being groomed as a replacement for Marion Hughes, Ralph's wife. As the title implies Julia tries to get everyone to believe she is not Marion, but the Hughes family and the servants have done a wonderful job of covering their tracks. Everyone in town and everyone who visits the house think Marion is recovering from a mental breakdown. As the story unfolds we watch Julia do her best to escape and get word to her only ally Dennis Bruce (Roland Varno), a neighbor and friend back at the boarding house, while the villains manage to outwit her at every attempt. Slowly we learn what happened to the real Marion and pray that the same thing does not happen to Julia. The combination of smart script, moody camera work, and a director with a keen eye for cinematic artiness raise this familiar story out of the realm of the ordinary. Though utterly predictable from the moment the plot is revealed the movie nonetheless manages to hold the viewer's interest with an enviable panache. The music, the snappy line delivery, the performances from the entire cast -- it's a stylish little movie there's no doubt about it. And there are odd and surprising details that seem to come out of nowhere. 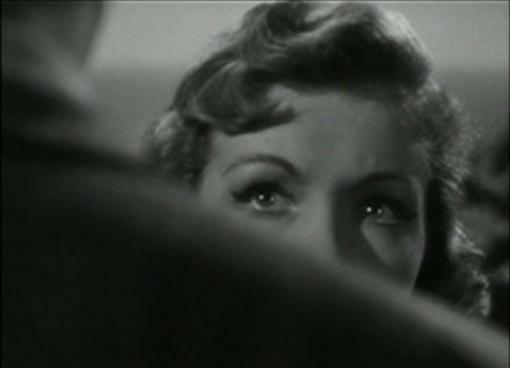 Mrs. Sparks draws Mrs. Hughes' attention to Ralph offscreen. Cut to Ralph on the couch seen from behind. 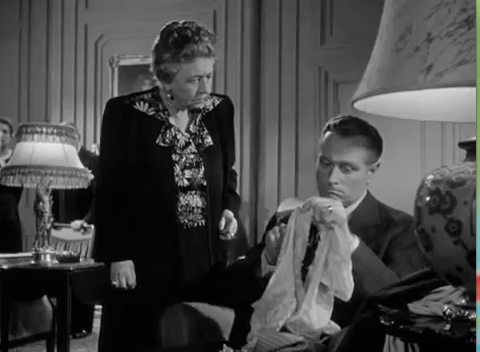 He's ripping a negligee to shreds with a pocket knife! Or an entire scene in which we see only Julia's frightened eyes over Ralph's shoulder while Julia and Ralph carry on their dialogue in voiceover. The expert photography is by Burnett Guffey. After decades of filming B movies and programmers Guffey would go on to win two Academy Awards for From Here to Eternity and Bonnie & Clyde. Muriel Roy Bolton does an admirable job with the economical screenplay by quickly packing in pertinent backstory and stripping down the exposition to its bare essentials so that the meat of the story with all its suspense filled moments can get moving quickly. Even the melodramatic score mostly pulled from stock music written for other Columbia Pictures' films enhances the movie. But it is largely due to director Joseph H. Lewis that My Name Is Julia Ross is a movie repeatedly mentioned as a something of a mini-masterpiece in suspense films. Lewis was a master at taking potboilers and turning them into entrancing movies that you can't turn away from. Each shot is a work of art. It also helps that in ...Julia Ross he had a top notch cast of talented actors. My Name is Julia Ross was supposed to be filmed in only ten days but studio executives were so impressed with what Lewis was doing they allowed eight extra days so he could produce the best movie possible. 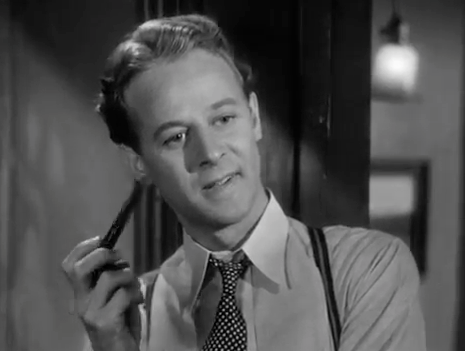 Lewis would go on to direct other thrillers like So Dark the Night, Gun Crazy (now something of a cult movie), and the melodramatic and brutally sadistic police drama The Big Combo. Each one shows his attention to detail, performance subtleties, and atmospheric lighting and framing. This is one of those movies that is so much better than one would think, given the limited budgetary resources, that it can make some poeple over praise it - great to get some balance here while acknowldging some fo the fine talent on display - freat review John. Have you ever seen the Arthur Penn remakes, DEAD OF WINTER starring Mary Steenburgen? It is perfectly entertaining but at the time I hadn't realised it was a remake so saw it before the original, which usually drives me nuts! I saw DEAD OF WINTER in the theater when it first came out in 1987. Roddy McDowall was in it, I had to see it! I was convinced it was based on a novel by someone like Ursula Curtiss. I obviously had forgotten about it being based on The Woman in Red or I would've mentioned it in the review above. One of these days I'll have to read the book and see which version is closest to the original source. I can't imagine Malleson (aka Gilbert) wrote that scene where Steenburgen gets her finger chopped off. If I bought DVDs, this would be on my list. A shame you can only buy it from the TCM website and that it'll cost you over $40 (plus shipping). It comes with four other movies in the set but there are only two films I'd like to see besides this one. Opportunistic resellers are hawking it now on amazon.com and elsewhere throughout this vast digital shopping mall, but it doesn't look like anyone is offering it at anything less than $44. I watched this last night, and I'm rather glad I didn't know it was such a big deal - because I wasn't disappointed, as I might have been! I watched (on youtube) because I love Dame May, and although it was predictable from beginning to end, it was - as you say - so stylish, and great direction. The Quandary Dilemma, or Help Me Out, Folks!